"The Transport Service Description and Transport Service Description Request documents are used for announcing available transport services and for requesting such transport service announcements. At this point there is no need for details about the specific items to be transported as the Transport Service Description Request is intended to be an informal request for a description of the transport services a Transport Service Provider has to offer. These two documents are not to be used in the booking/ordering of transport services where such item details are required. Here the Transport Execution Plan Request and Transport Execution Plan documents should be used and in these documents a detailed specification of the goods items is supported. What we have included in the Transport Service Description Request however, is the possibility to specify the type of cargo that should be supported in a transport service. This is supported by the association from Transportation Service to Commodity Classification (for example by using the CargoTypeCode BBIE). This way the Transport User (the party with a demand for transport) can specify for example that he requires a transport service that can support handling of dangerous goods. We have also included an association to Transport Equipment enabling the Transport User to specify which equipment he will be requiring from the transport service to satisfy his transport demand. 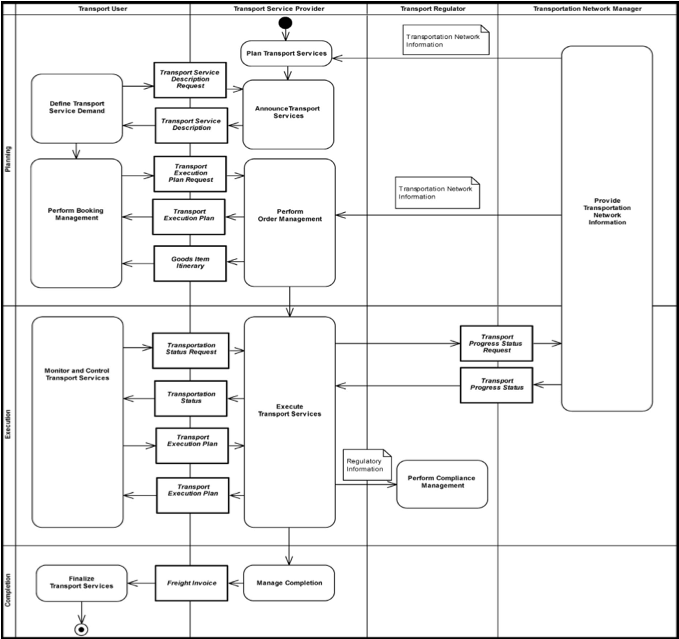 Below is an illustration that shows at which stage of the intermodal freight management process the Transport Service Description and Transport Service Description documents are relevant. The Transport User sends a Transport Service Description Request document to a Transport Service Provider as a request for available transport services fulfilling the Transport User´s transport demand. The Transport Service Provider then responds with a Transport Service Description that matches the details in the Transport Service Description Request (e.g. from- and to location, requested pickup and delivery time, cost preferences, cargo type preferences, etc.). When the Transport User has received (possibly many) Transport Service Descriptions matching his demand he begins the process of booking/ordering relevant transport services using the Transport Execution Plan Requests." could you respond to Carlos on this? I´m analizing the TransportServiceDescriptionRequest, and I couln´t found what is the element in which the good items to transport can be detailed. In TransportServiceDescriptionRequest->TransportationService->TransportEquipment->GoodsItem, I think that Items can be detaild but the meaning of TransportEquipment is different of good to be transported. Why this schema, not support the goods to be transported?